My hubs has been asking me on a date to Lee's Fried Chicken and Donuts for a few months now. My hectic schedule is the only thing that kept me from trying it sooner. 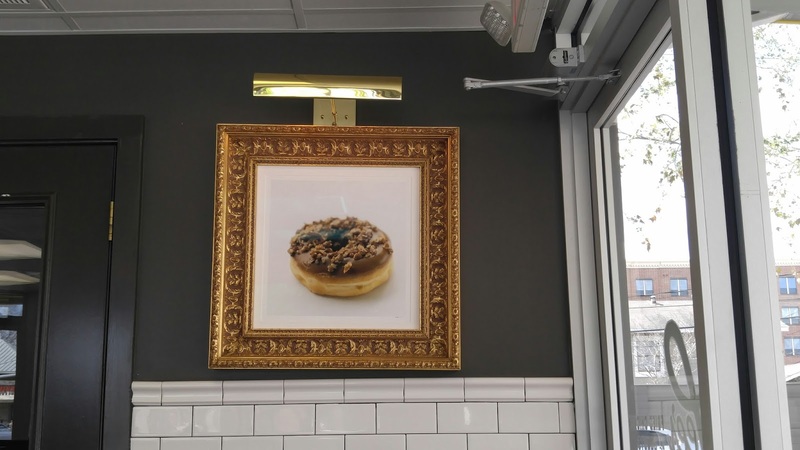 Thankfully, I woke up Friday morning with a clear schedule and a hankering for fried chicken and donuts. So, Calvin & I hopped in the car and made the 40 minute pilgrimage from Fresno to the Houston Heights. 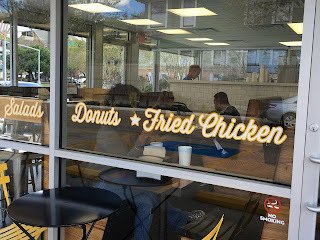 When we arrived at Lee's Fried Chicken and Donuts, I immediately noticed that the restaurant is quite small, and in my opinion, best suited for a grab and go type of meal. There is a drive-thru located on the left side of the restaurant for added convenience, along with a few tables and chairs outside. There are a few booths and high-top, bar type tables located along the perimeter of the restaurant as well. The menu is simple; fried chicken, donuts, kolaches, fried chicken sandwiches, various sauces and a kale salad. I find it interesting that they offer Icebox Fried Chicken as a menu choice. Anyway, I'm super indecisive when it comes to trying new menus, so it took me forever to make a selection. After about 10 minutes, I opted to piece together my own meal, as opposed to choosing from a pre-selected combo. I ordered a wing, a drumstick, and a jelly-filled powdered donut, with a pepper (can't forget about the pepper). 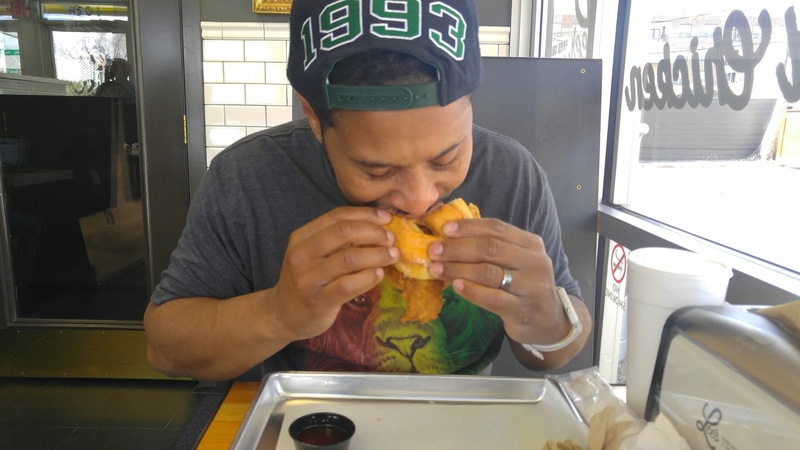 Calvin chose the Double Donut Fried Chicken Sandwich with Hot Sauce Syrup. As we waited excitedly for our food, I chose a booth in the corner, by the window. Our food was ready in about 15 minutes. You KNOW I had to snap at least 20 or so pics to share with all of you before we could touch our food-#BloggerDuty! 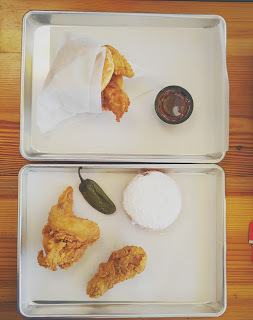 The chicken was pretty tasty, and so was my donut. I absolutely loved the donut's cherry filling! I did not like the fact that the breading kept falling off of my chicken, however, I did appreciate the overall taste and quality of my meal. I meant to try Calvin's Double Donut Fried Chicken Sandwich, but he devoured it before I even had a chance. In between bites, he told me that the sandwich was delicious. I DID get to try the Hot Sauce Syrup that accompanied his meal, and it was terrific! I used his sauce as a dipping sauce for my chicken for added spice and flavor. DOES FASHION CRAZED FOODIE APPROVE? In short, yes. I enjoyed Lee's Fried Chicken and Donuts. The staff was helpful and very friendly, which is extremely important to me. Next time, I'll try the Pulled Chicken Chopped Kale Salad & Calvin's favorite-the Double Donut Fried Chicken Sandwich.